Cinematic Paradox: Is Anyone Seeing This? Starring: Michael Shannon, Jessica Chastain, Shea Whigham, Tova Stewart, Katy Mixon, Natasha Randall, Ron Kennard, Scott Kinsley, Robert Longstreet. With the 21st of December fast approaching, people are either anticipating an apocalypse or laughing at the people who are scared that it will actually happen. But still, people have good intentions when they plan these so-called apocalypses: just take a look at all the stuff that has happened on the Earth in this past couple of years, the earthquakes, tsunamis, all of the other major disasters. They put these pieces together and suspect the worst is going to happen, sending themselves into fits of paranoia. That is exactly what happens to Curtis (Michael Shannon) in Take Shelter. He has dreams that turn him against the people and things around him - like his dog biting his arm, which results in the dog being left outside - and they culminate in a fear of an impending apocalypse. As the dreams get worse and worse, he finds himself comforted by a building project. This isn't the kind of building project that does any good right now, much to the dismay of his wife Samantha (Jessica Chastain). It is the kind where he takes out a risky home improvement loan to do up his storm shelter and create a haven in which he and his family can survive in if his visions do indeed come true. It doesn't matter which side of the fence you are on: whether you believe in an apocalypse or not, it is as equally hard to side with Curtis as it is to turn a blind eye. The vivid, terrifying dreams he has make his plight something we could believe in. But then there are the people around him who think that he is taking his fear a step too far. He steals equipment for it, he sleeps out in the storm shelter, he even spends the valuable money needed to treat his deaf daughter Hannah (Tova Stewart). He seems to be bringing a storm to his small town, unleashing all sorts of bad things upon the people around him. But just as those people are quick to judge his actions as those of a crazy man, we know about what is going on in his head. We know about the confusion he feels towards everything that is happening to him, about the fact that his mother had schizophrenia at around the same age. You feel sorry for him, just as much as you ponder his sanity. This is what makes Take Shelter a perfect portrayal of the human mind at it's most vulnerable and intense. And that is exactly what makes this such a terrifying picture. I've always been a fan of slow-burning thrillers, finding the intoxicating feeling you get from them far more effective than the cut-and-run nature of basic Hollywood thrillers. 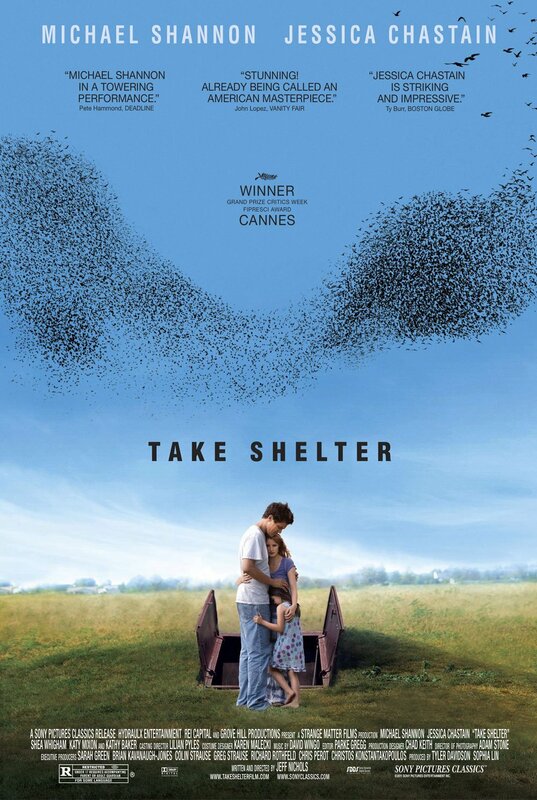 Take Shelter is indeed a slow-burner - a little too slow in some areas. 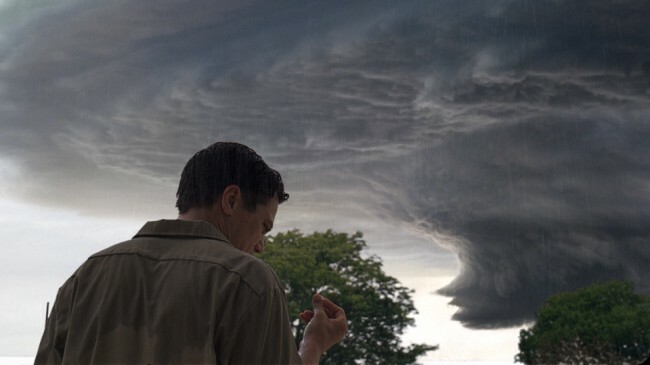 Despite the pacing issues, writer/director Jeff Nichols gives you plenty to chew on about both the state of Curtis' mind and the possibility of his apocalyptic visions coming true. He creates a true atmosphere, filled with uncertainty and ultimately isolation. As you would expect, there are quite a few ambiguous, frightening shots, particularly during the dream sequences. The film begins with Curtis standing outside with oily rain falling upon him. Nichols takes one thing and flips it on it's side like this, and doesn't dress it up with jumpy editing or over-exposure. He gives you one shot for you to observe and absorb, and it manifests itself into a terrifying vision with a hundred different meanings. That is the work of a true artist. Add on a sometimes violent, sharp, ambient score and you have the makings of something that requires a little thought to be truly scary, but once you get there, you can't help but being on edge. 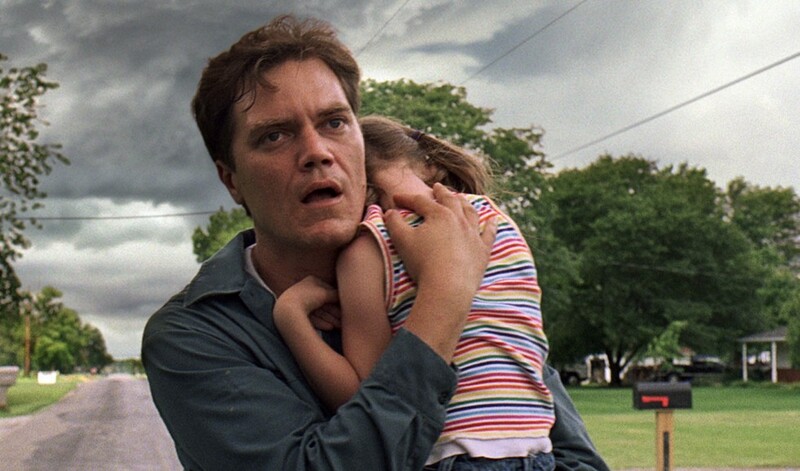 What Take Shelter deserves to be the most proud of, though, are the performances from both Michael Shannon and Jessica Chastain. They play off each other perfectly, first creating the idyllic family life with their deaf young daughter, then weaving their way through their married life. As that is set in stone, along comes the problems that Curtis faces, adding another layer to their dynamic. Shannon, an Oscar nominee for his scene-stealing performance in Revolutionary Road, gives another stellar performance here. I may sound like I'm adding to redundant cliché, but he really was screwed out of an Oscar nomination. He carries his character with sympathy and doesn't make himself out to be a monster, which is the vital key to the scene where he refuses to open the door to get out of the storm shelter. You believe that his visions have taken over his brain from just a simple look, which is a remarkable achievement from an actor. Chastain is also extraordinary in her role (but isn't that what we've come to expect?). While Shannon has the task of performing the meltdown, Chastain has to react to it. She does this with a quiet complexity, playing the terrified to Shannon's terrifying actions. They're both perfect - and hey, they should make more films together. The film's climax, though, is the best thing about it. The sheer ambiguity of it makes it something that manifests in your brain long after the credits have rolled. From the first instance of trouble, to the revealing shot, to the final thing that Samantha says...it is so beautiful composed that it left my head reeling. It was the perfect way to close off a film that made me want to sit down and write a film myself. But I should wait until I can shake the full effect of this film off before I try and write something that makes sense. Great review. I really liked it, even though it was a bit too slow and long for me. I loved the look, I loved the performances (hats off to Shannon), I liked the story, and I loved that last shot. There is certainly a lot to like about this film, apart from the pace. I'm going to start watching this in approximately an hour. Will write a review for early next week hopefully. I am pleased you liked this Stevee. A little more than I did actually. I found it a bit too dragged out in the middle act, even though it was stunningly performed throughout and the final act was great. Did you make the cinemagraph? Yeah, the middle act could have been condensed, but that was only a minor niggle for me. The final act was great! And no I didn't, unfortunately. I think it came off Tumblr! Oh I loved this film. Made my Top 10 - and I can't believe Shannon and Chastain were overlooked for their performances. This is the role Chastain should have been nominated for (and won for). Come to think of it, I think it was one of the best written and directed films of last year. No excuse for leaving a screenplay as relevant as this one out of contention. I love that it isn't just a film about schizophrenia and apocalyptic fears, but it is also a man facing a crisis of masculinity, and having to deal with real-world economic troubles. The film is creepy, extremely sad - and ultimately baffling. But, the conclusion raises several interpretations, and some of the possibilities are pretty mind-blowing. Great write-up Stevee. So glad you finally got to see it. It is criminal that Shannon and Chastain got barely any attention for their performances. They were both amazing. While I loved Jess in both The Help and The Tree of Life, this was her best performance of the year! And I totally agree with what you said. The film is so complex beneath the surface. I loved it. Great performances and great story. After this, I started doubting if The Help was Chastain's Glory performance. Nice Review !! Definitely do, it is very good. Watched this in theatres but need to watch this again. Very good flick. n I love the animated pics you have in this review. It is very good. And I like the animated gif too! Nice review! I like that animated GIF of Jessica's hair blowing in the wind, too. I'll be sure to rent this at some point. Thanks! Yeah, I mostly just like the gif for Jessica's hair. So preeeeeetty. 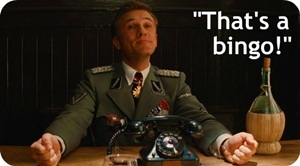 That GIF is awesome of a truly brilliant film. Yeah, I'm glad I found it! 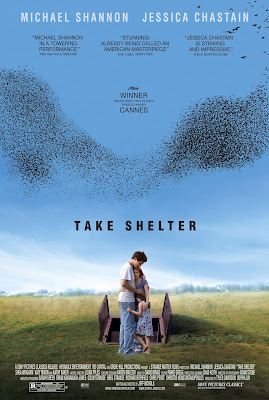 Great review, I loved Take Shelter. I know its been said before but this film and Shannon in particular got hosed by the Oscars. We have a pretty lengthy discussion on our blog about the film conclusion real vs dream or something else all together. Stop by and add your two cents if you get a chance. How did you add that sweet Gif that looks awesome? I will definitely check that out when I get the chance. Well, I just uploaded it like a normal picture (it came from somewhere else, I did not make it). I was basically just trying to see if gifs do work on my blog. It seems that they do. Great review. I admit that I'm usually in the Non-Apocalypse camp myself, but the slow burn that you talked about had me ready to go dig up my front yard! Yes, same! I'm a little more paranoid now! Great movie, I saw it in my local film festival last year. Shannon was amazing and Chastain did a wonderful job, she always has such a strong, appealing presence on screen. I agree, the ending was ambigous, but I think that helped the movie a little- made people talk and think of it afterwards. Good review Stevee! That is exactly right. Hopefully one of my friends watches it so we can have a little chat about the ending. Thanks! What I loved the most in the movie is that we see what Curtis sees and it's impossible to determine what is real and what's not, although I strongly believe the events in the ending were happening in the reality. great review! I think the end was reality. But it was Chastain's reaction to it which kind of threw me off a bit! I've only managed to watch this movie last week, and yes it was awesome. Definitely stays in the mind after the credits roll. Anyway, just discovered your blog today and I really love it. Especially the "Conversations with movies" posts. I'm still thinking about it now, and it has been a whole week! Thank you. I'd be happy if you stuck around! Great review! This movie really left a lasting impression on me as well, and I would almost certainly rank it in my top three films from last year. Just an all-around amazing feature.